Welcome to the Molecule of the Month page! This is one of the longest running chemistry webpages on the internet. Each month since January 1996 a new molecule has been added to the list on this page. The links will take you to a page at one of the Web sites at a University Chemistry Department or commercial site in the UK, the US, or anywhere in the world, where useful (and hopefully entertaining! ), information can be found about a particularly interesting molecule. Each month's new molecule will be announced on Twitter [@MoleculeM] and via an RSS newsfeed [http://www.chm.bris.ac.uk/motm/rss.xml]. If you wish to contribute a Molecule of the Month page, just email me the URL and I'll add you to the list at the next opportunity. (There's generally a 2-3 month waiting list, so this gives you plenty of time to write and polish your page). What do I need to see the pages properly? See here for all the details of software and helper files you require. In brief, next to each molecule name (scroll down the page) there will be one or more of the following buttons. Clicking each button takes you to a different version of the page, as described below. A simple HTML-only page with text and images. A page in pdf format. (Requires a Adobe Acrobat viewer). A page with optional VRML structure files. (Requires a VRML viewer such as Cortona). A page with embedded CHIME structure files. (Requires the CHIME plug-in to be installed on your browser). A page with embedded java structure files. (Requires Java to be enabled on your browser). See here for a list of the awards and citations received by this page and a disclaimer. Above is a drop-down alphabetical list of all the molecules. Click on your molecule of choice to take you directly to it in the chronological table below. Buy a book containing many of these molecules! 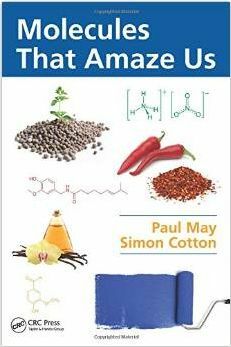 Paul May and Simon Cotton have compiled a set of some of the most important and interesting molecules from this website, as well as many more that have never been published before, and published them as a book that you can buy from the Taylor and Francis website or from other online retailers. Not just for drinking... HTML Shawn Huston Kenner MDL Information Systems, Inc.
J. Chem. Ed. a Molecule of the Week. Chebi (CHemical Entitites of Biological Interest) entity of the Month. and the Virtual Museum of Minerals and Molecules (requires Chime). Maintained by Paul May. This page was last modified Friday, 05-Apr-2019 15:47:28 BST and has been accessed times since 11/10/96. Back to Bristol University School of Chemistry Home Page.